Palau is a beautiful island nation that attracts just a handful of tourist each year (only 136,572 in 2016) who want to partake in its natural scenery, friendly natives, and perfect relaxation, but most people come here for the unparalleled dives, during which they will encounter sharks and manta rays and with a bit of luck large marine mammals like common dolphins or even small whales. There are also hawksbill turtles, dugongs, and a myriad of colorful reef fish, along with invertebrates and corals. This list could go on and on, but the biggest attraction in Palau underwater are its sharks! Palau is one of the few places in the world, where you can still encounter a large population of these graceful hunters on almost every dive. In this article, we discuss 4 of them. All sharks of Palau are protected by the Palau Shark Sanctuary which was the first of its kind when founded, and we will also have a closer look at how Palau protects its sharks. Situated several hundred miles off the coasts of Australia and the Philippines, Palau is a peaceful oasis in an otherwise turbulent ocean. The biodiversity in the region leaves little room for other ocean paradises to compete, thanks in large part to its geological/volcanic activity and one of the largest sets of barrier reefs in the entire world. One of the best examples of this diversity is the number of different types of sharks in the area. All of these sharks can make the experiences of scuba diving and snorkelling all that much more adventurous. Whether you have already arrived on the island nation or are planning a trip in the near future, you probably want to learn more about these majestic creatures. 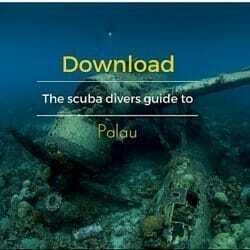 We’ll discuss four common types of sharks in Palau you can expect to encounter when out on the open water around the more than two hundred islands in the country and on world-famous Palau dive sites like the Ulong Channel or Blue Corner Palau. As the name suggests, grey reef sharks are one of many types of sharks that live in and around coral reefs. Since Palau’s surrounding waters are saturated with coral reefs, the grey reef shark is the most common type of shark you may encounter while scuba diving in Palau. Grey reef sharks are very agile and can swim extremely fast, making them a dangerous predator for smaller fish and even other sharks. The grey reef shark is not a large shark by traditional standards; the majority of them measure less than six feet (two meters) in length and the heaviest one ever documented weighed a bit over 70 pounds (33 kilogrammes). 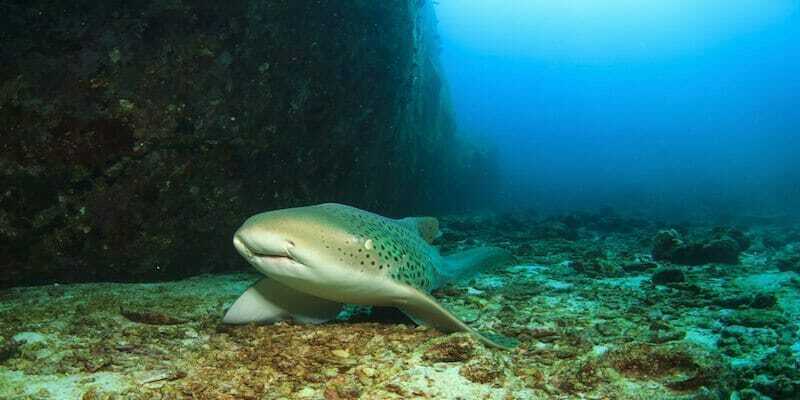 In most circumstances, these sharks stay in waters of less than 200 feet (60 meters) deep. Despite this, it has been documented that some grey reef sharks will dive up to five times deeper than that for brief periods of time when food is scarce. Many of these sharks in and around Palau become much darker than the ones you will find in other parts of the world, as they tan due to the sunlight. 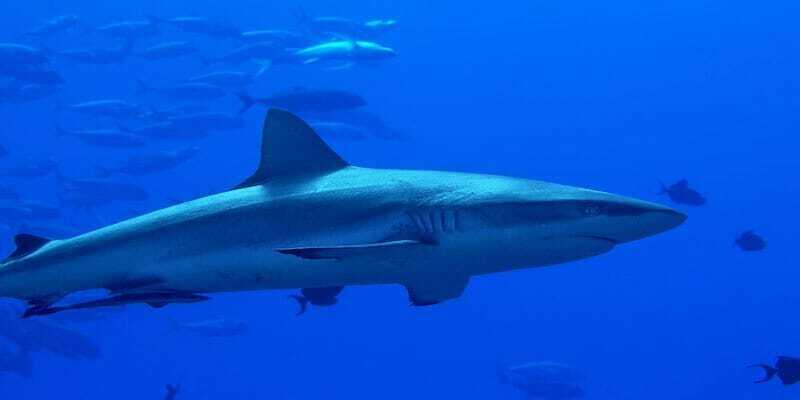 The gray reef shark is prey for sharks such as the silvertip shark, but around Palau, they generally are classified as top predators. The leopard shark is the smallest and least intimidating of the four sharks, measuring around one and a half meters long and weighing less than 15 kilograms on average. Even the most casual of snorkelers and scuba divers in Palau will encounter these rather cute sharks, as they almost always confine themselves to depths less than one a half meters deep. Palau is unique in being one of the only locations in the western Pacific where the leopard shark can be found; in almost every other case, it is confined to the western coast of the United States and Mexico. Another smaller type of shark that is common in Palau’s waters, the whitetip reef shark, measures less than two meters in length and almost never ventures into waters deeper than 50 meters. These sharks are very curious of humans when they first enter the water and may get very close, but they will not attempt to engage or attack you. 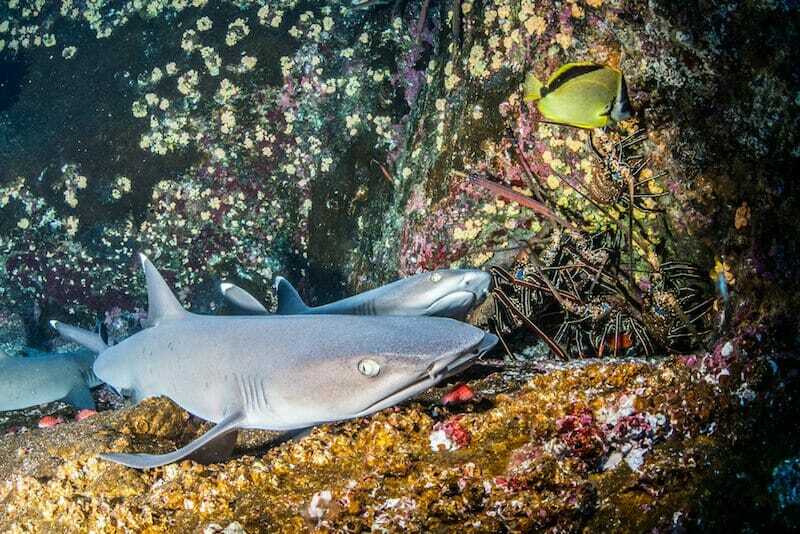 The whitetip reef shark has a very low reproduction rate; this, combined with their limited habitats mean that it is slowly becoming more endangered. With 40-50 teeth in each row and multiple rows in its mouth, this shark is quite adept at devouring its prey. When it is hungry and looking for sustenance, it is common to find the whitetip reef shark hunting in groups like a pack of wolves to make the process more efficient. Since this species weighs less than 40 pounds, a group is often more effective at taking down larger forms of prey when hunting together. So as you can see, many species of sharks are endangered and need our protection. Palau was the first one to realize that and offer their population of these predators their very own Shark sanctuary, the very first shark sanctuary in the world. One really great thing about Palau that makes it especially popular is the fact that the people of the country actually care about the environment. Because their culture and their livelihood is so closely linked to the sea, Palauans want to do everything they can to preserve the natural beauty and balance of the oceans, and that requires that they take big steps to conserve the many marine species that call the waters surrounding the Palau islands home. In 2009, the news was released that the president of Palau intended on creating a shark sanctuary. It would be the first shark sanctuary on the planet, and it would forbid any form of commercial fishing of sharks. This step later led to the formation of other shark sanctuaries around the world, particularly in the Maldives, Honduras, Bahamas, and Tokelau. Palau forbids any kind of shark fishing within its Exclusive Economic Zone, and the shark sanctuary covers roughly 600,000 square km, protecting species which are already endangered or vulnerable. The nation also hopes that the rest of world will follow suit and ban shark fishing completely. In early 2014 Palau declared an area the size of France a no commercial fishing zone. By doing this, the biggest marine sanctuary in the world was created. Palau is well known for its conservation efforts to protect the endless species that inhabit its waters. Bottom trawling, for example, was also banned by the island nation in an effort to protect the sea floor from commercial fishermen who use giant nets and destroy everything in their wake. But the great news is that Palau was able to create the shark sanctuary it wanted, thereby successfully protecting over 135 Western Pacific shark species, as well as rays, making an effort to prevent them from becoming endangered or extinct. In doing so, it has effectively raised the standard that other nations across the globe need to follow in order to save the sharks that are so vital to the balance of the ocean’s ecosystems. Palau continues to help educate both individuals and entire nations about the importance of protecting sharks in their natural habitats by not only talking about the issue but also by setting a fantastic example of what’s possible when the right efforts and laws are implemented to protect the diverse sea life that allows the oceans to thrive. Please feel free to contact us directly if you would have any questions. We love to hear from you.